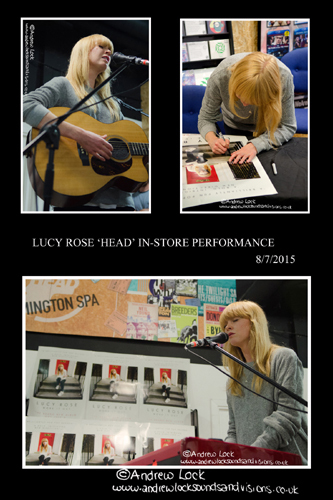 Lucy Rose is a singer/songwriter who spent most of her early years in Leamington Spa, she is an accomplished artist gaining rave reviews for her work and unbelievably this performance at ‘Head’ in the Royal Priors was her debut live in the town. The event was in support of her latest album ‘Work It Out’ which was released on Monday 6th July (I have played it to death and is one of my current favourites) and anyone who pre-ordered at the store received preferential tickets for the show. The store soon filled up with fans and I am sure when she started a lot of other shoppers in the vicinity would have joined the throng as she sounded sensational. Lucy mentioned that the show was a bit unusual for her as due to space restraints she could not perform as is usual with her band so this was a stripped back performance with Lucy swapping between acoustic guitar and piano during the set. The numbers performed from the new album seem to work as well with the stripped down treatment as with the full band production on the album with Lucy’s exquisite voice even more prominent. Highlights of her seven song set included opener ‘Like an Arrow’ which is a beautifully flowing, pure love song with an enchanting melody and the wonderfully light and breezy ‘For You’. The wonderfully warm ‘Till the End’ with for me just a touch of the All Saints ‘Pure Shores’ with Lucy showing her prowess on the piano was another one of my personal favourites from an excellent show. Plenty of chat from the likeable artist from the stage including the exciting news that the next day she was performing on the famous Radio 1 'Live Lounge'. After the performance a long queue was formed for the planned meet and greet and album signing with Lucy giving everyone plenty of time for a chat and a photo op if wanted. So pleased I discovered this artist who is a new one for me, I just happened to see the poster advertising the show in ‘Heads’ window and checked her music out on-line and immediately knew it was for me. Lucy has a wonderfully sweet singing voice, is a true multi-instrumentalist and a song/writer of some quality and completely deserves the success she is getting which included playing ‘T in the Park’ this weekend.